We’ll open today with prayers for all the victims of Harvey. You’re in our thoughts! The more aggressive Fed members were very quick to talk rate hike after the GDP report on Wednesday. We hope this jobs report will ground the hawks, because while this economy is showing real signs of life, it is nowhere near needing a break pumping! A continued belief seems to be that it is inevitable that inflation will show up so these hikes are “prophylactic.” It doesn’t work that way folks, and this jobs report DOES NOT signal inflation is on the way. We’ll explain. The economy is still fragile and erratic in its growth. There are too many domestic policy and international uncertainties, reaching levels of downright fear in some cases, like North Korea. Any efforts to keep the economy from “overheating” at this stage are very premature, and the worst thing that could happen for the global economy would be for the U.S. to have to take rates back down. So, Fed, are you listening? Please watch and wait!! The details are decidedly mixed, and if we had to say lean toward weak, but there are some notable bright spots, too. The headline of 156k was a miss on an expectation that just wasn’t very high to begin with (180k). We are being told that wages for the Private Sector only grew .1% month-over-month, but it’s worse than that. The .1% is hourly. Weekly, in other words, salaried workers actually lost ground at -.2%. 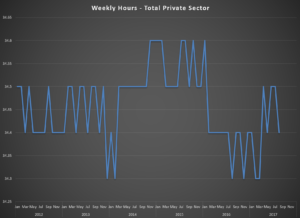 Weekly Construction lost .1% and Manufacturing lost .6% and a whopping 1% for hourly and weekly employees, respectively so “FED ARE YOU LISTENING? – – NO INFLATION!” The work week remains stubbornly short. Today’s chart is the work week length going back to 2012. The Labor Force grew by 77k, but the Not in Labor Force and Unemployed columns posted triple digit adds. The Participation Rate remains under 63%, and nobody (should care) cares about the Unemployment Rate. To put this into some more perspective, Andre Boucher from Pavilion (www.pavilioncorp.com) sent me a sobering statistic published by Eddy Elfenbein at Crossing Wall Street (www.crossingwallstreet.com). He calculates “In order to have the same jobs-to-population ratio as 17 years ago, we’d need 10.5 million more jobs, or 16.3 million fewer people.” That certainly tells us 156k, 165k, and even 180k per month just won’t get us there. Today’s headline of 156k factored a -9k for Government payrolls leaving the Private Sector tally higher than the headline at 165k. Even though the June and July totals netted out to -41k in revisions, the Private Sector netted +4k, so that is not at all insignificant to the good. The wage disappointment (this is hopeful optimism) may be due, in part, to a temporary dilution effect in Manufacturing and Construction as both sectors made solid gains in payrolls with hefty upward revisions to the previous two months. In fact, the Diffusion Index is at 63.8 for the entire Private Sector and a massive 73.1 for the 78 Manufacturing industries. For comparison, those numbers were 55.7 and 42.3 respectively just one year ago. This validates the Regional Fed surveys regarding strength in Manufacturing hiring and more evidence that anecdotal optimism is starting to enjoy the support of hard data. We talk about that a little more in the Blue World Economic Index® which came out yesterday. In an unfortunate note, the Fed has abandoned their Labor Market Conditions Index, which followed many of the same key indicators we do and, therefore, tracked very well with our analysis and forecasts. It was one of our favorite internal and external metrics for this analysis as well as a component of the Employment category in the BWEI®. Not to worry, however! We’ll keep doing it for them! !